Why invest in a Windows Desktop Search tool? 5 hours/week searching for documents. 2.3 hours/week searching for, but not finding documents. That's at least 2.3 hours of hours wasted per week for having not the appropriate tools. According to their studies, time wasted in document creation and management activities costs the organization $ 9,071 per information worker per week. That's a lot in a year when you can install a tool, such as Copernic Desktop Search, for the price of $ 49.95 USD per license. CDS has become the world's #1 Windows desktop search tool for PCs. For the past 10 years, companies have switched to Copernic Desktop Search because of it's easy-to-use, instant and reliable search engine. Copernic has been in business for 20 years. Our job is to help you search your documents faster. Copernic Desktop Search is a standalone software with a very simple installation process. Anyone can install it and it works on computers with very basic requirements. We know how valuable your information is and we make sure that the information is kept in your environment. Copernic Desktop Search does not allow the transmission of your keywords, search results or their content back to Copernic. Therefore, we do not see what you are looking for or the content of your documents. From home users, to small businesses, to mid-sized companies, to major corporations, Copernic Desktop Search has become the go-to Windows desktop search tool for PC users worldwide. Added new search extensions. Added a new extension online store to buy extensions & bundles. Added a new extension to search Google Drive. Added a new extension to search Microsoft OneDrive Added a new extension to search Dropbox. Added new languages for the user interface: Japanese and Korean. copernic, copernic desktop search, desktop search, Windows Search, Windows Desktop Search, search engine, file search, document search, email search, outlook search, x1 search, google desktop search, Email Sear Smart Windows Desktop Search engine for your computer provided by Copernic. 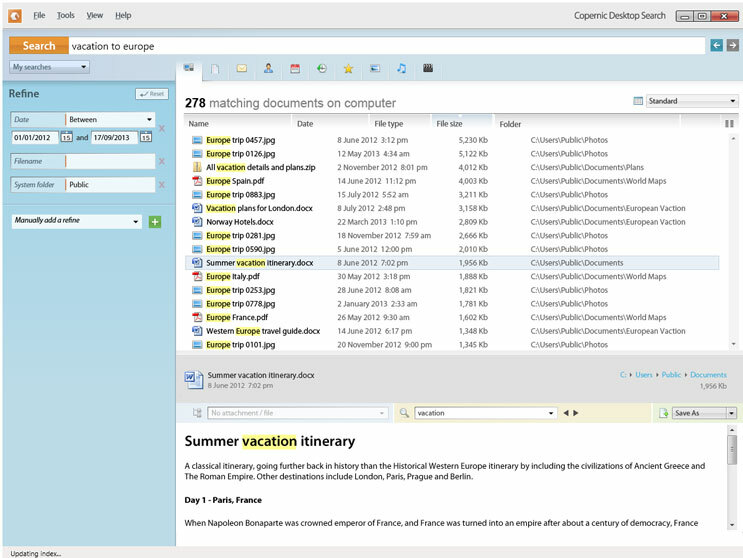 Copernic Desktop Search is the best alternative to Windows Search as it allows you to centralize your document, file & email searches in one unique interface.